Located in west Taipei, Ximending is one of the most popular tourist spots among both local and international travelers. Ximending features a wide selection of fashionable clothing and accessories in many styles include Japanese, Chinese and Western. Ximending is similar to Shibuya in Japan, both are famed for a diversity of entertainments and activities that allure large numbers of young people and young adults. It is often a gathering site for young people and has been noted the most fashionable and popular shopping area in Taiwan. Ximending is filled with all kinds of shopping options, from department stores to shops and stores, including various CD shops, hair salons, Eslite Department Stores, movie theaters, Karaoke and many others. Other than enjoying various activities, do not miss the chance to sample famous dishes of Ximending such as “Ya Rou Bian” for tasty duck meat, “Ay-Chung Flour-Rice Noodle” for an unique experience appreciating delicious rice noodles in long line, “Simonfood Tempura” for mouth-watering Taiwanese style tempura, “Lautianlu” for stewed and braised food, plus many other delicacies that will satisfy your taste buds. Ximending is often crowded by visitors as there are abundant options of shops and restaurants. Being a hot spot in Taipei, a lot of celebrities choose to hold concerts and events at the Ximending Walking Street. 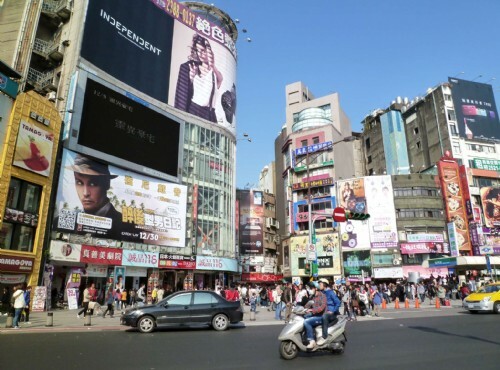 With an excellent location close to Taipei Main Station, Ximending offers great convenience in transportations with MRT and a multitude of buses. For travelers coming from other cities, they may simply take train or THSR (Taiwan High Speed Rail) to Taipei Main Station and then take a short MRT ride or 10mins short walk to Ximending area. 1. Take bus no. 9, 12, 49, 202, 205, 206, 212, 218, 223, 231, 234, 242, 246, 249, 250, 252, 253, 260, 262, 263, 265, 302, 204, 207, 310, 527, 601, 604, 624, 628, 651, 652, 660, 667, 701, 702, 703 or 705 to MRT Ximen Station stop (捷運西門站). 2. Take bus no. 62, 229, 231, 234, 242, 264 or 310 Sub line (310副) to Ximen Elementary School (西門國小). 3. Take bus no. 18, 221, 232, 235, 257, 513, 621, 635, 540, 659, 663 or Blue 2 to Ximen Market stop (西門市場站). Take Taipei MRT-Bannan Line (捷運板南線) to exit no. 6 of MRT Ximen Station (捷運西門站). © 2019 Backpackers Hostel. Powered by DFone Technology Corp.